A member of NIAO staff, with the consent of the C&AG, is designated by the Northern Ireland Department of the Environment as the local government auditor. This person, assisted by other members of NIAO staff, performs the audit of local government bodies. In holding public bodies to account through our activities, we seek to promote the better use of public money in order to make a difference for the people of Northern Ireland. Who is the Comptroller and Auditor General for Northern Ireland and what is his role? The C&AG for Northern Ireland is Kieran Donnelly. As C&AG he is head of the NIAO, an Officer of the Northern Ireland Assembly (the Assembly), a Crown appointment made on the nomination of the Assembly and totally independent of government. He has been in post since September 2009. The C&AG is the statutory external auditor of central government bodies in Northern Ireland. He reports the results of his work to the Assembly which are considered, in the first instance, by its Public Accounts Committee (PAC). The audits undertaken by the local government auditor are reported to the local government bodies. Each year the local government auditor prepares a report on the exercise of the auditor’s functions in that year and sends the report to the local government bodies and the Department of the Environment. These include the Audit (Northern Ireland) Order 1987, the Northern Ireland Act 1998, the Government Resources and Accounts Act (Northern Ireland) 2001 and the Audit and Accountability (Northern Ireland) Order 2003. 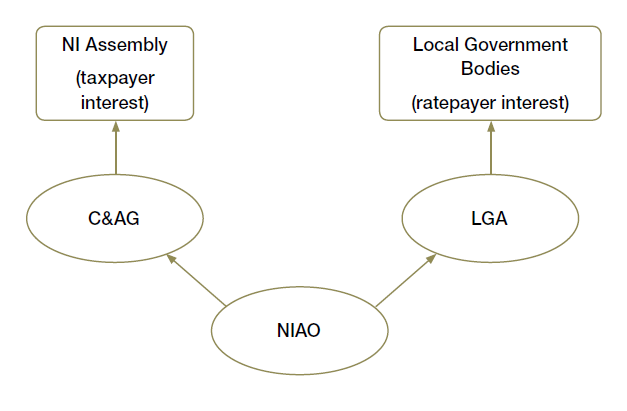 The principal legislative authority for the responsibilities of local government auditors is contained in the Local Government (Northern Ireland) Order 2005 and the Local Government (Accounts and Audit) Regulations (Northern Ireland) 2006. and the Local Government (Northern Ireland) Act 2014. Oversight of NIAO performance is carried out by the Audit Committee of the Assembly, which is required by the Audit (Northern Ireland) Order 1987 to agree the annual estimate of the use of resources of the NIAO. The Committee and the NIAO have signed a Memorandum of Understanding on the Governance and Accountability arrangements of the NIAO. Our accounts are audited by an independent firm appointed in accordance with the 1987 Order. In addition to our audit outputs, including general reports on financial audit work, value for money reports and good practice guides, we publish a range of corporate documents including the NIAO Corporate Plan, which is prepared on an annual basis setting out our key strategic aims for the next three financial years, how we propose to deliver these and the resources that are required to do so, and the NIAO Annual Report and Accounts. These are available on our website at www.niauditoffice.gov.uk.